Rabbit polyclonal Phosphoserine antibody. Validated in WB, IP, ELISA, IHC, ICC/IF and tested in Species independent. Cited in 64 publication(s). Independently reviewed in 6 review(s). Recognize proteins phosphorylated on serine residues. Does not cross-react with phosphotyrosine. Will detect 50 ng of phosvitin with immunoblotting or 0.5 ng of phosvitin with immunocaptured ELISA. Antibody slightly cross-reacts with phosphothreonine (about 20%) based on indirect ELISA data. Mouse brain extract for Western Blotting. Synthetic phosphopeptide or phosvitin for ELISA. Our Abpromise guarantee covers the use of ab9332 in the following tested applications. IP Use at 10-0.25 µg/mg of lysate. Use at 10µg/0.25 mg of chromatography fractionated protein sample. WB Use a concentration of 2 - 4 µg/ml. To block use 3%BSA with 0.1% gelatin (do not use milk). We recommend that the antibody solution should contain 0.5% BSA to prevent non-specific binding. ab9332 staining Phosphoserine in Human osteosarcoma SAOS-2 cells by ICC/IF (Immunocytochemistry/immunofluorescence). Cells were fixed with paraformaldehyde, permeabilized in 0.25% Triton in PBS and blocked with 1% BSA for 1 hour at room temperature. Samples were incubated with primary antibody (1/500 in PBS + 1% BSA) for 1 hour. 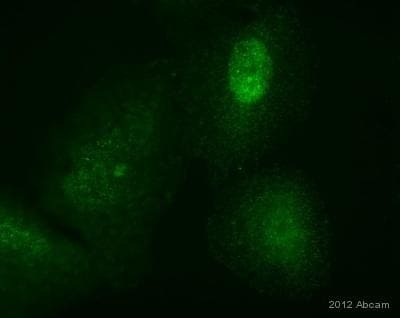 An Alexa Fluor®488-conjugated Goat anti-rabbit IgG polyclonal (1/250) was used as the secondary antibody. The detected band is 53 kD, and is a similar size to the p53 tumor suppressor factor. The cells were treated with 0, 50, 200 or 400 J UV (lane A to D, respectively) and with 0.1uM of okadaic acid(lane E). Actin level was measured as an internal standard of cell protein. Western blotting of a melanoma cell lysate with anti-phosphoserine antibodies. The detected band is 53 kD, and is a similar size to the p53 tumor suppressor factor. The cells were treated with 0, 50, 200 or 400 J UV (lane A to D, respectively) and with 0.1uM of okadaic acid (lane E). Actin level was measured as an internal standard of cell protein. Publishing research using ab9332? Please let us know so that we can cite the reference in this datasheet. I understand that you can not provide the immunogen sequence but can you tell me if in your opinion the antibody is going to work with plasmodium samples? you know the immunogen sequence so you can tell me whether it is probable that the antibody is going to work with plasmodium material. ab9332 is an anti-phosphoserine antibody and its immunogen is a KLH-phosphoserine conjugated to BSA. Since this antibody isn't specific for a particular protein but rather phosphoserine (a single modified amino acid), the species in which this antibody is used is not important. The important thing is that it is guaranteed to work in your application and that the samples used contain proteins which are phosphorylated on serine. Please note that this phosphoserine antibody is pan-specific, however, steric hindrance by some adjacent amino acids may prevent efficient antibody recognition. We have not performed extensive studies to further characterize the affect of surrounding amino acids. I'm using ab14372 in WB but not seeing any signal in my yeast samples using a 1/1000 dilution. I am sorry this product did not perform as stated on the datasheet and for the inconvenience this has caused. As requested, I have issued a free of charge replacement of ab9332. Customer received the antibodies at RT. Please find attached the requested data. Our customer would like to purchase phosphoserine and phosphotyrosine antibody for mouse sample. I have checked ab9319 and ab9332 mentioned thatmouse sample can be usedas a positive control so I recommend those two antibodiesto the customer. Please confirmmouse samples are okay. I can confirm that these two antibodies (ab9319 and ab9332) recognize modified amino acid residues (phosphotyrosine and phosphoserine respectively) on any proteins including murine samples. You are correct that mouse samples can be used as positive control for both antibodies. I have searched ab9332. It doesn't have application for IHC-Fr and customer wants to test with testing discount. Please arrange a discount code. Thank you for your enquiry. I am pleased to hear the customerwould like to make use of our testing discount offer and test ab9332 in IHC-Fr. This code will give you: 1 free primary antibody before the expiration date. To redeem this offer, please submit an Abreview for IHC-Fr and include this code in the Additional Comments section so we know the Abreview is for this promotion. Please remember that submission of the Abreview is sufficient for the discount code to become active. Any feedback that you can provide will be greatly appreciated, whether positive or negative. If you have any further questions, please do not hesitate to contact us. We look forward to receiving the Abreview and wishthe customer luck with their research. Thanks a lot for your detail information, which is very helpful. I have considered all product you suggested based on my plan. I think I will buy the Pan-specific phosphoserine antibody (ab9332) as you mentioned. 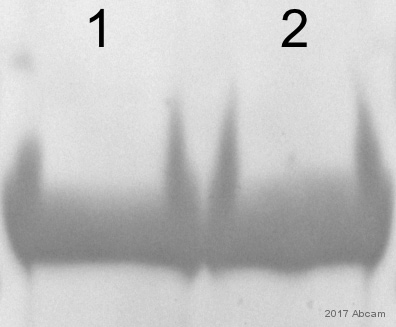 The first application is that I will use it to detect a purified protein phosphorylation by GSK3b after kinase assay by western blot. The purified protein is mouse origin. If it works well, I will apply this antibodies in other experiments in vivo by using immunostaining in different cell line and tissues. The cells and tissues come from mouse,rat, monkey and human. Is there any new application there? I will order the antibodies today. What's the best price for that?